Definition at line 37 of file face-traits.hpp. Definition at line 173 of file face-traits.hpp. Definition at line 47 of file face-traits.hpp. Definition at line 53 of file face-traits.hpp. Definition at line 61 of file face-traits.hpp. Definition at line 67 of file face-traits.hpp. Definition at line 75 of file face-traits.hpp. Definition at line 81 of file face-traits.hpp. Definition at line 89 of file face-traits.hpp. Definition at line 95 of file face-traits.hpp. Definition at line 103 of file face-traits.hpp. Definition at line 109 of file face-traits.hpp. Definition at line 117 of file face-traits.hpp. Definition at line 123 of file face-traits.hpp. Definition at line 131 of file face-traits.hpp. Definition at line 137 of file face-traits.hpp. Definition at line 145 of file face-traits.hpp. Definition at line 154 of file face-traits.hpp. Definition at line 183 of file face-traits.hpp. Referenced by ndn::nfd::FaceTraits< FaceEventNotification >::getFaceId(), and ndn::nfd::FaceTraits< FaceEventNotification >::setFaceId(). Definition at line 184 of file face-traits.hpp. Referenced by ndn::nfd::FaceTraits< FaceEventNotification >::getRemoteUri(), and ndn::nfd::FaceTraits< FaceEventNotification >::setRemoteUri(). Definition at line 185 of file face-traits.hpp. Referenced by ndn::nfd::FaceTraits< FaceEventNotification >::getLocalUri(), and ndn::nfd::FaceTraits< FaceEventNotification >::setLocalUri(). Definition at line 186 of file face-traits.hpp. Referenced by ndn::nfd::FaceTraits< FaceEventNotification >::getFaceScope(), and ndn::nfd::FaceTraits< FaceEventNotification >::setFaceScope(). Definition at line 187 of file face-traits.hpp. Referenced by ndn::nfd::FaceTraits< FaceEventNotification >::getFacePersistency(), and ndn::nfd::FaceTraits< FaceEventNotification >::setFacePersistency(). Definition at line 188 of file face-traits.hpp. Referenced by ndn::nfd::FaceTraits< FaceEventNotification >::getLinkType(), and ndn::nfd::FaceTraits< FaceEventNotification >::setLinkType(). Definition at line 189 of file face-traits.hpp. Referenced by ndn::nfd::FaceTraits< FaceEventNotification >::getFlagBit(), ndn::nfd::FaceTraits< FaceEventNotification >::getFlags(), ndn::nfd::FaceTraits< FaceEventNotification >::setFlagBit(), and ndn::nfd::FaceTraits< FaceEventNotification >::setFlags(). Definition at line 191 of file face-traits.hpp. 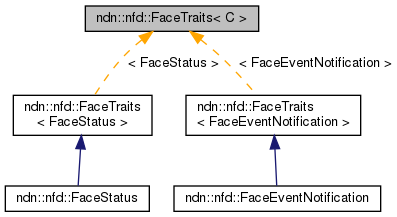 Referenced by ndn::nfd::FaceTraits< FaceEventNotification >::setFaceId(), ndn::nfd::FaceTraits< FaceEventNotification >::setFacePersistency(), ndn::nfd::FaceTraits< FaceEventNotification >::setFaceScope(), ndn::nfd::FaceTraits< FaceEventNotification >::setFlagBit(), ndn::nfd::FaceTraits< FaceEventNotification >::setFlags(), ndn::nfd::FaceTraits< FaceEventNotification >::setLinkType(), ndn::nfd::FaceTraits< FaceEventNotification >::setLocalUri(), and ndn::nfd::FaceTraits< FaceEventNotification >::setRemoteUri().